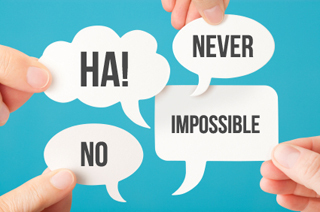 Innovative people have always had their fair share of critics: “It’ll NEVER work!”; “It’ll never FLY!”; “It’ll never FLOAT!”; “It’ll never stay SUBMERGED!” Anyone who knows their history, has learned to NEVER say “Never”! Still, many of us, as creators, are on the receiving end of the “No can do” attitudes and criticisms of certain agents, editors, publishers, financiers, and other assorted people who choose to see all the obstacles to any given project or goal. For your encouragement, we’ll now share the story of a creator and her naysayers. And since we’ve been discussing cookbooks in our Angel in the Kitchen series, we’ve chosen as our subject, the late Julia Child, who wrote one of the most influential cookbooks of the 20th Century. Julia Child was born in Pasadena, California, on August 15, 1912. Although she’s Internationally recognized as a multiple award-winning chef, author and television personality — as well as THE person who introduced and popularized French cooking in America — she attained none of this notoriety until she’d reached the ripe age of 51. Late bloomer? Some things are worth waiting for. in 1937 and spent the next four years writing for local publications. During World War II, Child tried to enlist, in both the WACs (Women’s Army Corp) and the U.S. Navy’s WAVES, but was rejected for being “too tall”! So, Child joined the famed OSS (Office of Strategic Services) and worked her way up from typist, to a top secret researcher. While working in the Secret Intelligence division, Child had a variety of jobs that took her to Washington, D.C., Sri Lanka (Ceylon), and eventually to China. But her most interesting assignment may have been as the assistant to a research team developing shark repellent! The foul-tasting stuff was needed to keep sharks from exploding mines intended for German U-boats. So how in the world did Julia Child end up as the last word on French cuisine? While in Paris, Julia attended the famous cooking school Le Cordon Bleu, and later studied with several master chefs. She also met Simone Beck and Louisette Bertholle, two French women who were trying to write a French cookbook for American readers. They quickly convinced Julia “the English major” to collaborate with them. That was around 1951, and the three cookbook creators spent the next decade researching and repeatedly testing recipes. Child translated the French into English, and worked to make the recipes detailed and interesting to American cooks. Finally, their book was finished. All they needed to do was find a New York publisher. Piece of cake? The three authors were told repeatedly that their 726-page manuscript was “too long”! Other objections included: “No one’s interested in preparing gourmet food”; “No one’s buying cookbooks these days”; “If someone wants a recipe, they’ll just tear it out of a magazine”! When a door finally opened, and Houghton-Mifflin signed them to a contract, the editors then rejected the manuscript because it seemed too much like an encyclopedia. Alfred A. Knopf Company ultimately published Mastering the Art of French Cooking in 1961. It was a critically-acclaimed bestseller, and it’s still in print to this day. More books followed, as well as a long-running television show. 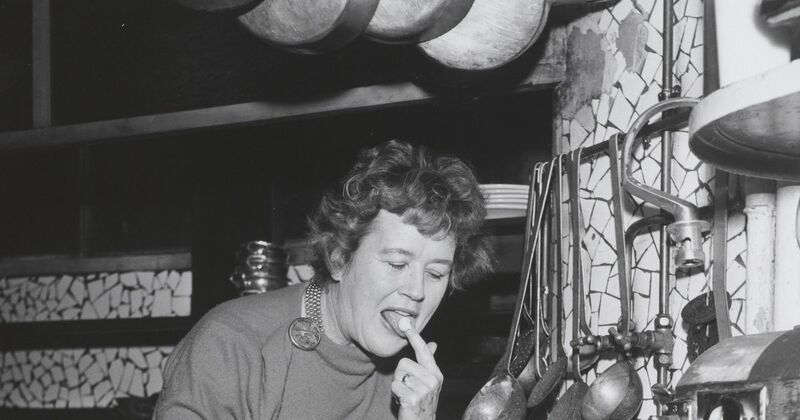 And would you believe, the kitchen set, where for years Julia Child cooked up special dishes for her legions of viewers, is now permanently exhibited in the Smithsonian.